On the stove top, heat a large, a Dutch oven over high heat. Add in the bacon and cook until crisp. Remove bacon and drain. 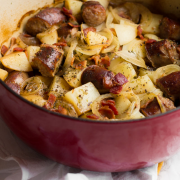 Leave the grease in the Dutch oven. Add the sausages in, a few at a time (don’t crowd the pan), and cook on each side until just golden brown. Remove to a plate and continue with additional sausages. Slice into 1″ pieces. Reduce the heat to low, and then whisk in the flour. Cook for 2 minutes, whisking constantly. Then remove from heat completely. Whisk in the bottle of beer. Place 1/2 potatoes in gravy, followed by 1/2 onions, 1/2 garlic, 1/2 bacon, 1/2 sausages, 1/2 parsley, bay leaves, thyme, and pepper. Pour the broth over the whole thing. Place lid on, and bake for 2 hours.